Our students have returned to study after the three week break in October. November has also seen the temperatures dropping, signaling the end of the rainy season and the beginning of the cold season. For our long time supporters, you know what that means- winter jackets for our students! The pictures here capture the joy only possibly because of your generous support, be you a regular donor or one of our wonderful child sponsors. Thank you so much for enabling us to do what we do! A view of the mountains as BF goes out to distribute winter jackets to our teachers and students. Here are our 12 scholarship students who received their annual winter jackets, hats, and two free pairs of shoes thanks to generous locals! As for the progress of our students, Kru Gaew of the Lahu Sheleh Moonlight School checks on them every week, twice a week, to ensure that they're healthy and attending school. 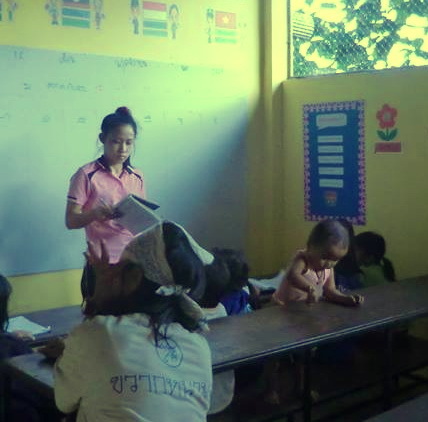 Kru Gaew is Tai (also known as Shan), just like our students, so they can communicate using their first language. All of our students are healthy and have been keeping up their excellent attendance. The new jackets match the new school building! If they didn't look excited in the last picture, our students sure where when they saw that they got socks to match! Kru Gaew and her students at Nong Tao Sheleh Village School pose with their new winter gear! Kru A and her students stand in front of their recently renovated school and their colorful warm coats.